Q: Why did the pitcher give up more home runs last year? A: Because more balls went over the fence! 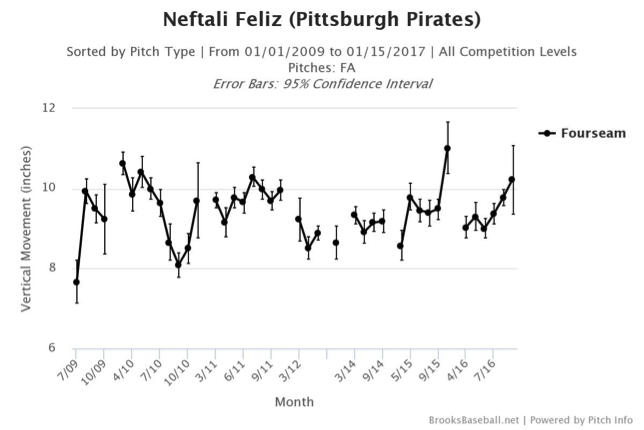 Besides being a punchline to a joke that would absolutely rule the day on playground duty, the above answer may give us some insight into the Brewers’ interest in free agent relief pitcher Neftali Feliz. At first glance, Feliz’s line from last year might not inspire much confidence for a serviceable replacement to Tyler Thornburg or Will Smith. 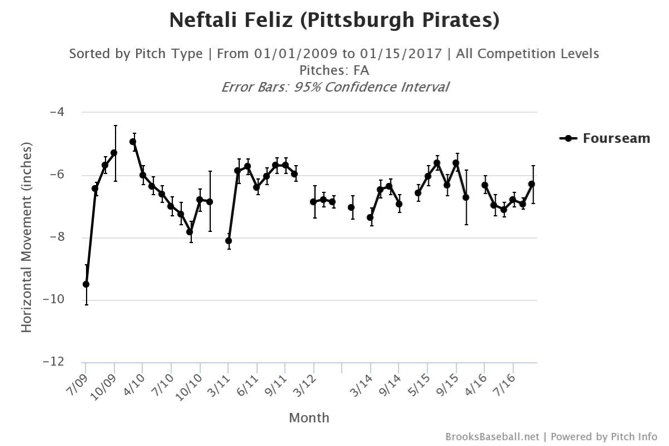 In 53.7 innings, Feliz posted a 3.76 DRA and 4.57 FIP, largely off the 10 home runs he allowed. That was the most home runs per nine innings he has given up in his career. Nothing much in his peripherals glares out as an obvious problem, except for a 19.2 percent HR/FB rate, which was 16th-highest in MLB last year among pitchers with at least 50 innings pitched. In fact, that rate of fly balls that left the yard is more than double his career rate of 8.8 percent. Of course, it’s possible that his pitches were just more hittable, with pitches thrown that were more susceptible to the home run, but consider that he also posted groundball rates and strikeout rates that were his best since his breakout 2009 with Texas. Last year, he also saw the highest swing rate of his career, along with the lowest contact rate. So batters were swinging more at Feliz’s pitches and making contact less than ever. You can’t really point quickly to his pitch mix to explain the inflated homer rate, either. Feliz’s velocity also has ticked up a mile and a half per hour above where he was sitting with his fastball in 2015. 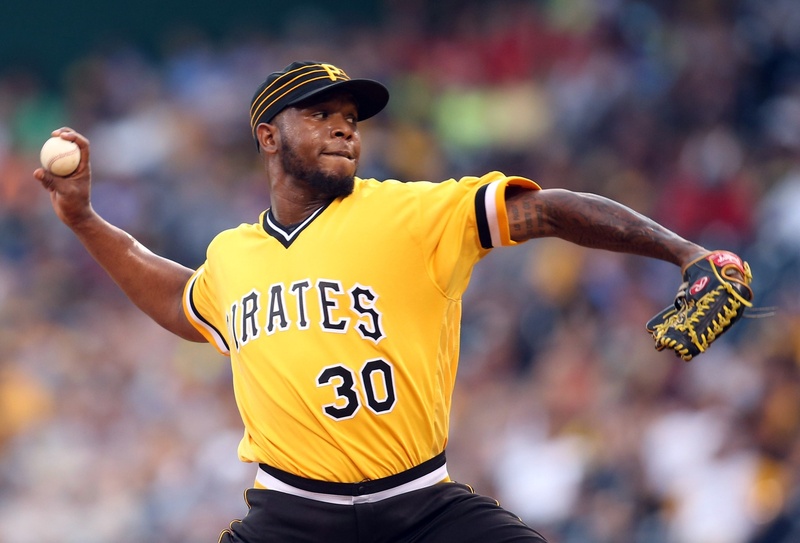 With the Pirates, he has almost abandoned his changeup, working primarily with his four-seam fastball and slider, which is a positive step forward as his changeup was getting just a 7 percent whiff rate last year. Really about the only thing Feliz didn’t improve upon from his career numbers under Ray Searage and the Pirates was that HR/FB rate. As simple and perhaps redundant as it seems, his home run troubles really do seem to be a matter of more fly balls flying over the fence. Still, it’s not as if those 10 home runs just ran into someone’s bat by accident. According to ESPN’s Home Run Tracker, 8 of those round-trippers were “plenty” of distance, and just 1 was considered “just enough.” His 104.5 MPH average exit velocity on home runs is slightly above the MLB average last year, and was 39th among 214 pitchers who gave up at least 10 homers. Whether explainable by a mechanical change, slight changes to his pitch effectiveness, or just luck, the Brewers front office seems to be banking on regression to the mean in his home runs allowed per fly ball. That would pair well should groundball and strikeout tendencies to continue to trend in the right direction in front of their improved defense this year.